Winning the TAC Medal for being best-on-ground in Oakleigh’s TAC Cup premiership victory completed an even better year for Kade Answerth than his successful 2014 season. Despite sharing the best-and-fairest award in the first of the club’s back-to-back premiership years, the overage midfielder (he turns 19 on Saturday) missed out on being drafted to the AFL last November and was invited back to the Chargers this year. Answerth repaid the faith with 30 disposals, 10 clearances and seven tackles (including 21 disposals and nine clearances in the first half) in the 12-point triumph over the Eastern Ranges at Etihad Stadium on Sunday. He said Oakleigh’s run to the flag from a sixth-placed finish at the end of the home-and-away season gave him important opportunities to prove himself on big stages. “I think the TAC Cup finals are just behind the U18 Championships in terms of where recruiters would like to see you perform well in, so the further we could go in finals, the more chance we had of boys proving themselves,” Answerth said. With doubts presumably over his height (180cm) and foot speed, Answerth’s focus in 2015 has been to improve his game to the point where his prolific performances are difficult for recruiters to ignore. He said his physical strength, explosiveness from stoppages (particularly evident in the Grand Final) and composure with the ball in hand had all improved this season. 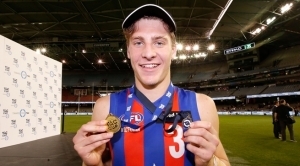 The Caulfield Grammarians product has also spent time at higher levels, representing Vic Metro at the U18 Championships and playing three senior VFL games and six Development League games with Port Melbourne. “Playing VFL footy and Metro this year has really held me in good stead coming back to Oakleigh,” Answerth said. “I played through the midfield against Essendon and you gather a lot of confidence from playing on guys like David Zaharakis and Heath Hocking. “I think I had 17 touches and Zaharakis was best-on and had 28, but there was one time when I got off him and took a lead-up mark which I was pretty happy with. Having averaged 24 disposals and almost six tackles per game in 14 TAC Cup matches and 14 disposals per game in his three senior VFL appearances, Chargers coach Michael Stinear said Answerth deserved to be given a shot at the elite level. “The year Kade’s had and the way he finished the season speaks volumes for his character and his football ability,” he said. When Eastern drew to within two points of Oakleigh at three-quarter time on Sunday after trailing by 30 at the main break, Stinear implored Answerth and his fellow midfielders to lift their game once again in the final stanza for 2015. “In the three-quarter time huddle, the coaching staff just wanted us to get first hands back on the ball, because Eastern beat us to the ball in that third quarter,” Answerth said. Kade Answerth’s performance answered that question definitively – and perhaps raised some new questions for recruiters to consider in the process.